The Quinta is located in a private position. It is surrounded by meadows, nature wild life. The center of the village and its shops are only 2 km away from the house. Enjoy delivery of fresh bread everyday, and fresh fish every week, at your door. With 2.500 hours of sunshine per year and Mediterranean temperatures, the center of Portugal definitely is the ideal holiday destination. The recently renovated cottage, located near to Tomar and the lake Castelo de Bode in the center of Portugal, is available for short or longer stays. 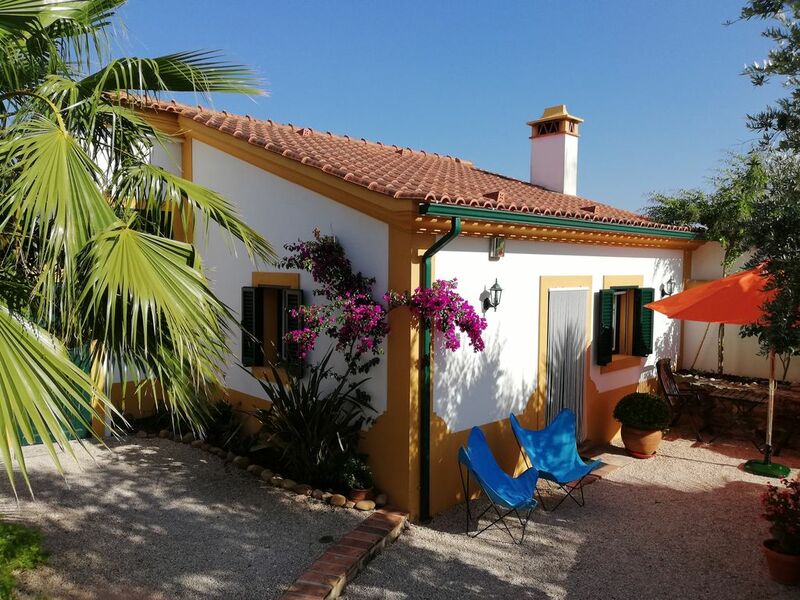 The house has been fully restored with durable materials in a traditional style, with double glazing and is situated in a calm area with a beautiful view on the countryside. It offers a space for short or long stays. The house has an open living room with a kitchen and tiled flooring. Heat will be provided by an traditional wood burner which heats the whole house during winter months. There is a television, a DVD player and a selection of games for the entertainment of guests. The kitchen is completely equipped with built-in kitchen appliances. The work surface is in granite. There's an electric oven, a four ring gas stove, a kitchen extractor fan, a fridge with built in freezer compartment, a microwave oven, a toaster, a coffee maker, a Nespresso machine, a juice machine and a kettle. The house also has a washing machine located in an adjacent building with drying and ironing facilities. The bathroom is located near the living room and is partially tiled, with a traditional wooden ceiling. it is equiped with a sink, a toilet and a shower cabin. There are 2 bedrooms situated on the first floor, which is reachable by a wooden staircase. There's a big room with a double bed, a wardrobe, a chest of drawers and a nightstand. The second bedroom has 2 single beds (that can be joined to form double bed), a wardrobe, a chest of drawers and a nightstand. The cottage has a private terrace and a completely private garden with a barbecue. It also has a private parking place and a private entrance. The cottage has satellite TV and DVD Player. We also have reliable babysitters who care for your children during the day or evening as you want without a moment between them from the children. The owner resides in the domain and is at your disposal. They receive and will provide you with detailed information, such as organizing a taxi, car rental when you arrive or other information you deem necessary. If you want may be for food or flowers be provided upon your arrival. In the winter, special rates are offered for longer stays. You can reach us 24h mobile phone. Absolutely beautiful property ideally located close to the idyllic Castelo do Bode lake and the historical World Heritage site of Tomar. The 2 bedroom property is very spacious and laid out with everything you would need for a very enjoyable stay. Good transport connections to Lisbon and Porto airports and the historic City of Coimbra and the stunning Silver Coast resorts are within easy reach. The house and gardens are extremely well appointed and there are some lovely seating areas to take advantage of the stunning views which surround the property. The gardens are really pretty and the owner is extremely helpful. There is easy access and good parking areas. Extremely enjoyable stay and highly recommended to all. Thank you very much! It is indeed an unspoilt part of Portugal and the guests who enjoy it the most are the ones who are looking for a little authenticity! Thanks again and really hope you come back again one day. The property listing is absolutely accurate. The booking procedure with Anne-Sophie was straightforward and very quick. The welcome at the property was first class; warm, friendly and so helpful - I could recommend the property from this aspect alone. The house is fully equipped. The information book in the house is really comprehensive. I am not usually moved to write reviews but the welcome and service at "The Quinta do Feonix" was of such a high standard that it would have been wrong of me not to have done so. Of the properties we rented during our European trip this year none could compare to “The Quinta do Feonix”, both in the property's amenities and in the ease we had in planning our stay. We are a couple with two teenaged children – Anne-Sophie, we would like to thank you again for sharing your heart and lovely home with us and are looking forward to visiting again for many years to come. Thank you so much for sharing your thoughts here on Home Away. We are thrilled to hear that you enjoyed your stay with us, and thank you for your kind words. We are incredibly flattered to hear that you consider us one of the best – it means so much to us. We would love to be given the opportunity to welcome you back! The bedrooms are well separated and my kids slept soundly every night in their own beds. This is something we look for everywhere we go (twin beds in a separate room) and it is very hard to find!! So to spend five days here with the kids having their own beds was a true luxury. The master bed was very comfortable. They also provided every amenity you can think of: bedding, linens, dishtowels, paper towels, soap, laundry soap, tea, sugar, spices, DVDs, games for the kids, umbrellas, shopping bags, maps, advice on local attractions and restaurants, you name it! We would love to come back, stay longer and explore the region even more. Thank you so much for taking the time to write this review, and for choosing to stay at the Quinta do Feonix. We thank you for your warm recommendation and hope to welcome you back in the future. We stayed at Quinta do Feonix over Christmas and New Year's and had a wonderful time. Anne-Sophie made us feel welcome from the moment we stepped out of the car. The house had plenty of room for our family of 4 and our dog. It was very well equipped and had everything we needed for our stay. My girls enjoyed playing outside and my husband enjoyed the walks in the surrounding region with our dog. I enjoyed a relaxing holiday. We plan to return!!! Thank you Anne-Sophie for taking care of all the little details that make a holiday special! Our aim is to have all our guests satisfied and we will never be happy with less than that. It was very nice meeting you and your family and hopefully we will meet again. Lacking words to describe a perfect Eden ! Maybe there is another place as beautiful as this one in the world, but Quinta do Feonix remains unique to the 4 of us. Because of all the people around, because it is far from everything except the lake which is incredibly nice to swim in, and so so beautiful. I've visisted many places, I've been far away, but never was I so touched by a place. Thank you for sharing that paradise with other people. Thank you for being so cool (everything you could ever think of is there, including a coffee machine, a bread machine,) and the baker and fishman that stops by at the house is absolutely awesome!!! Finally, it's the perfect place to visit: Tomar, Constancia, Bathala, Alcobaça...So just go as if you were going to visit family, because it really feels like home! Lots of car noise, late night parties, discos and music bars! NOT! This was a perfect location to unwind and escape the rat race long warm days by the lake just what was needed, the house came fully equiped. I have ever used abroad almost akin to your own spice and equipment wise, very easy to find (did have my doubts) but instructions where spot on, supermarket (Continente) is easy to find you simply follow the road to Tomar and there it is around a 10 min drive and very reasonably priced. A deffinat must is a visit to the Castle in Tomar it is with out doubt superb. The lakes where really nice to swim in and a really nice spot, the water is clean and cool the Dam is also worth a visit. All in All a very nice place to stay in deed nothing like watching the sun go down in the garden chairs with a glass of wine. I did wonder who the fool beeping his horn was every day, I didn't realise till the last day it was the bread van! So when you hear it, it stops just a little further down from the cottage so pop down and buy some bread we missed this experiance, ah well there is always next time, Would we go back here........ ABSOLUTLY, without a doubt. Thank you for posting your review. We are delighted that you enjoyed your stay with us and that you appreciated the comfort of our house and our services. We work hard to ensure that all guests can make the most of their stay by providing an orientation to both the local area and the cottage amenities. Our aim is to provide a place where you can come back to in the evening and relax. We look forward to welcoming you back in the near future. Take a deep breath and enjoy the sweet scent of the surrounding orange orchard. This is Portugal at its best. We welcome you at “Quinta do Feonix” (farmhouse “do Feonix”). This is a place to recharge your batteries and feel at home. This is also the ideal base from which to discover the center of Portugal. From Lisbon airport, it is only 1 hour and 15 minutes drive to Martinchel. The guesthouse is over a century old and restored to its Portuguese charm. It offers atmosphere and space, with two bedrooms, a comfortable shower room, an equipped kitchen all decorated in a unique style, surrounded by a terrace and a garden with barbecue. The cottage of the Quinta also offers you a FREE wi-fi access.